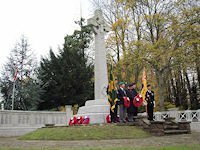 There are projects in progress around Surrey seeking information about the lives of those listed on War Memorials around the County, so that they can be remembered and honoured, not just as names but as men and women with families and stories to be told. Photograph: The Ashley Road War Memorial Remembrance Ceremony in Epsom. Courtesy of Clive Gilbert.